Fans are loving the transgender subtext of the season finale of Steven Universe. Steven Universe is a show on the Cartoon Network that has been around for five years. Created by Rebecca Sugar, who is bi, it’s the first Cartoon Network show to be created by a woman who wasn’t working with a man. The show is about several human-looking aliens (called Crystal Gems) who live in the fictional town of Beach City. One of them gave up her physical form to create a child with a human, and that child is Steven, who carries her gemstone in his navel. In the season 5 finale, entitled “Change Your Mind,” Steven is trying to convince the interstellar Gem Empire’s matriarchs that he is really a boy as he visits the Homeworld. Since he carries his mother’s gem, they believe that Steven is his mother, and even call him by her name. He manages to convince all of the matriarchs except for White Diamond. White separates Steven from his gem, expecting him to return to the form of his mother. Instead, a pink version of Steven and a lifeless, gem-less form of Steven are formed, and they have to reunite. “I only want you to be yourself. If you can’t do that, I’ll do it for you,” White says while attacking the Stevens. “For transgender viewers, that framing of the relationship between Steven and [his mother] might strike a nerve,” wrote Julie Muncy at Gizmodo. She went on to point to specific elements of the episode, like Steven trying to get the matriarchs to call him by his name, as “strikingly similar” to struggles transgender people face. And on Twitter, trans people noticed the subtext. Felt amazing going to bed after watching the latest Steven Universe. 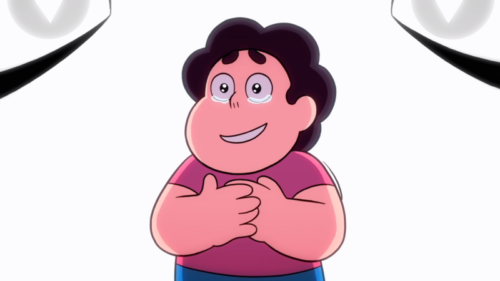 Thank you @rebeccasugar for giving me those moments of feeling accepted.